For Week 7 of the 2018 Oregon high school football season, here's a look back at the Plays of the Day. To see complete game stories from all these contests, go to the Prep Football Tab. 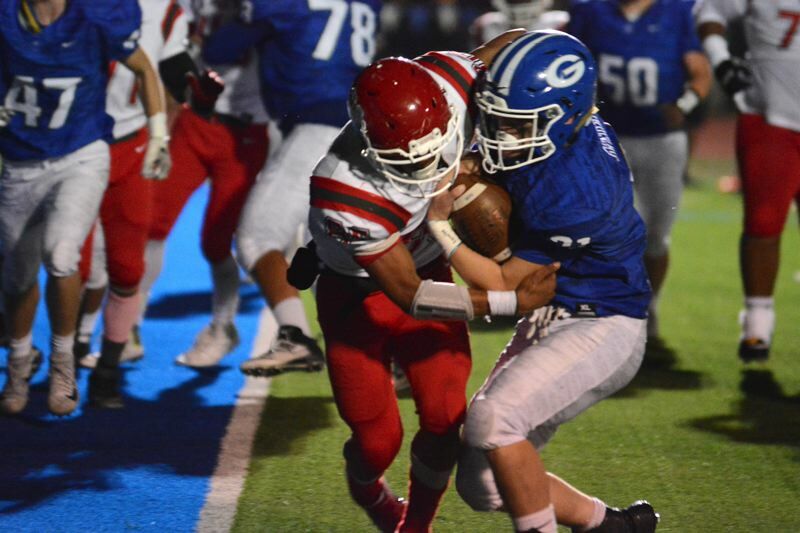 GRESHAM 47, DAVID DOUGLAS 24: Gresham running back Austin Pick took the ball around the left side and was met at the 1-yard line by David Douglas safety Michael Hodge. Pick dropped his shoulder into the hit and tumbled into the end zone to put the Gophers in charge 40-24 with five minutes to play. CENTRAL CATHOLIC 49, SANDY 13: After Sandy scored their first touchdown of the game late in the first half, Central Catholic came up with a response when running back Miles Jackson broke through the Pioneers defense and rumbled 43 yards for the score, putting the Rams up 28-6. BARLOW 54 CENTENNIAL 0: Barlow running back Jobadiah Malary rushed for three scores on the night, but it was his 50-yard interception return in the second quarter that really put the game on ice as the Bruins took a 28-0 lead into the half. 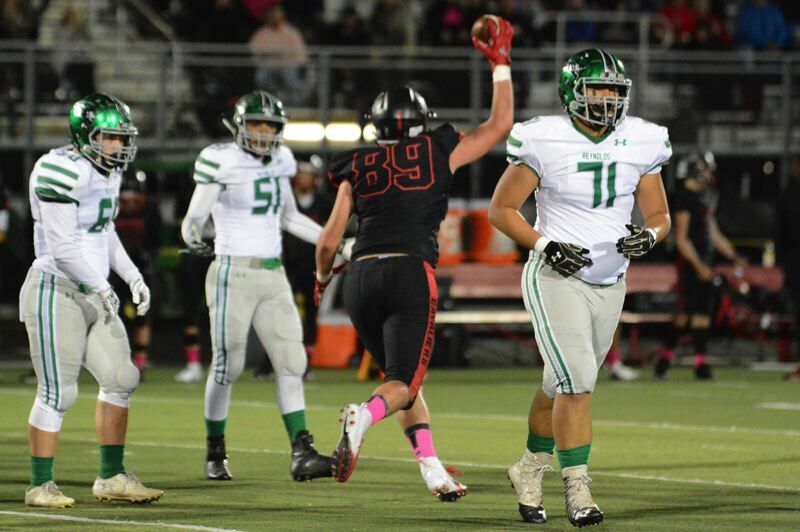 CLACKAMAS 38, REYNOLDS 12: The Cavaliers stuffed four runs inside their 5-yard line to prevent Reynolds from making it a one-possession game in the second quarter. Clackamas scored three plays later when QB Austin Atkenson lofted a deep ball over the top to Richard Kennewell for an 83-yard touchdown and a 24-6 lead. WOODBURN 14, CROOK COUNTY 12: The Crook County Cowboys had just scored to close to within 14-12 against Woodburn. The Cowboys lined up in a spread formation and snapped the ball to Erick Gonzalez, who initially appeared to cross the goal line with the tying points. However, the officials ruled that a stout Woodburn defense had gotten Gonzalez to the ground prior to his breaking the plane of the goal line. The defensive stand was just enough to propel the Bulldogs to the narrow victory. LAKERIDGE 48, TIGARD 38: Tigard, getting a 32-yard field goal by junior Jackson Cleaver, upped its lead over Lakeridge to 31-27 early in the third quarter. The Pacers answered with a 60-yard drive, mainly getting yardage behind the running of junior Jalen John. Lakeridge capped off the drive with a 6-yard scoring pass from senior quarterback Charlie Maynes to senior receiver Will Scadden. The TD gave the Pacers a 34-31 lead and they didn't trail again the rest of the contest. SUNSET 54, BEAVERTON 21: Sunset junior quarterback Callum Craig tossed a picture-perfect fade route to a place where only Nate Archibald could catch it and the Apollo receiver climbed the ladder in the left corner of the end zone and snagged the ball out of the air to go up 37-7 in the third quarter. LAKE OSWEGO 33, CANBY 12: The game could not have started any worse for Canby, or any better for Lake Oswego. On the opening kickoff from Canby senior Rizdin Miller, Lake Oswego senior Matthew Sebolsky returned the ball 75 yards for a touchdown just 14 seconds into the game. A missed PAT kept the Laker lead at 6-0 but launched the team toward its eventual 33-12 victory. WEST LINN 45, TUALATIN 20: After Tualatin's Kyle Dernedde fumbled the ball away to West Linn sophomore linebacker Cole Peters near midfield midway through the fourth quarter, Lion junior wide receiver Casey Tawa took an end around to the left side, sped 14 yards to score and give his team a 38-14 lead with 4:57 left in the game, effectively ending any Timberwolf hopes of a comeback.